Everything you need to make unique pendants; materials include beautiful papers, glass or wood tiles, craft glaze and adhesive, organza pouch, and tutorial. Each component is hand selected and tested to make sure the jewelry making experience is a success. Five smooth-edged clear Glamour FX Glass square 1"
My grand girls are working w these and enjoying their time! Gave this as a gift to teenage girl. Directions were thorough. Materials seem durable and good quality. Great detailed instructions; 8yr Old was able to do with minimal adult input. Finished product surpassed expectations. Highly recommend. Think talented,artistic Granddaughter will love this Christmas gift! 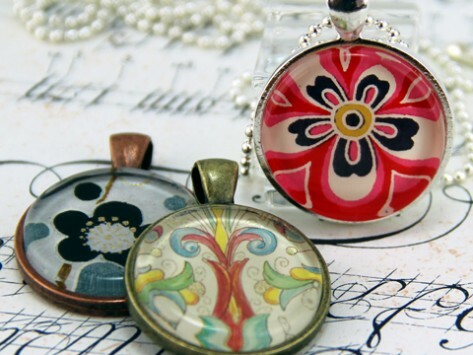 Afraid you aren’t crafty enough to make your own jewelry? Fear not, Annie Howes’ DIY pendant kit is the perfect way to create your own one-of-a-kind glass pendants without having to track down all the supplies. Annie is a graphic designer and former art director with an eye for detail. After making these conversation-starting pendants on her own, she posted a how-to on her blog. But it dawned on her that people didn’t just want the tutorial, they wanted something with all the materials and instructions included, and her business was born. The kits come with everything you need to make keepsake pendants (and rings, in some of the kits), along with the step-by-step instructions and a metal tin to keep the supplies organized. The premium papers that come with the kit are hand-selected by Annie. These crafty kits are an ideal activity for preteen or teen girls—and they’re just as much fun for adults, so grab five friends for a jewelry making party and plan a girls’ night in.